Roasting the tarro root (or sepan kizhangu in tamil) has become easy. Yes, it's unbelievably deep roasted and unbeatably tasty with just three teaspoons oil. Here is the recipe. Just follow the recipe word to word and you will avoid mushy or over cooked sepan kizhangu roast. Wash the vegetable, cut each tarro into half and pressure cook it for 10 minutes with just half or 1 cup water. Do not overcook the tarros. You can check if it is cooked enough by piercing a knife into it. It should slide in smoothly. Peel off the skin and keep it aside. Take a ziplock cover. Add turmeric, salt, red chilli powder and 2 teaspoon oil and mix well inside the ziplock. Add the cooked and peeled vegetable and seal the cover. gently mix in the vegetable with the mixture in the cover until it is evenly coated. In case you don't have a ziplock, just use a bowl and toss the vegetable until evenly coated. Take a oven safe tray and line it with aluminum foil. Spead the coated vegetable and keep it in oven under broil. Let it broil for about 25 to 30 minutes, tossing the vegetable every 10 minutes. Broil until the vegetable is golden brown with a crispy lining. Heat a teaspoon of oil in a large kadai. 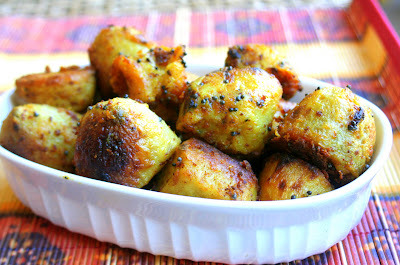 Add mustard seeds, when it pops, add the asafoetida powder if you are using and then, add the golden roasted vegetable. Toss a couple of minutes in heat and turn off the heat. The low fat deep roasted sepan kizhangu is ready. Serve immediately with any rice like sambar rice, rasam rice or even curd rice. The taste is very very delicious.